Whether you’re shopping for yourself or a gift, nothing compares to high-quality leather. With a large shop of products to choose from, Gavere Leather helps you create a brand-new look. Our selection of personalized leather products allows you to shop for every piece you need. Whether you need a high quality belt or a wallet that will last you for years to come, our selection has the variety you need. Our personalized leather name buckle comes in either an embossed name or initial. If you’re searching for the piece that no one else will have, this is the right choice for your wardrobe. For those shopping for a custom holiday gift, a personalized leather billfold lets you shop for everyone on your list in one place. The men in your life will love knowing how much time and effort you put into making their gift perfect for them. Add just a name or initial, or show how much you really know them with an image or symbol. Similarly, our leather dog tag holders are also a great gift option for birthdays or anniversaries. 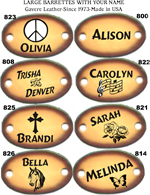 Personalized dog collars, personalized Leather Barrettes, Key Rings, and Name Buckles are personalized by laser engraver (burned in), which comes out dark brown against the lighter brown, airbrushed product. There is no white as shown in some of the pictures. 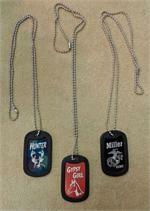 GI Dog tags and Guitar Pics are anodized aluminum. The engraved name and design come out white. LARGE QUANTITY (50+) DISCOUNT FOR GROUPS, ORGANIZATIONS, OR PROMOTIONS.